This full-day tour of Pompeii and Herculaneum begins with a visit to Herculaneum, a Roman residential town on the seacoast that was remarkably well preserved by volcanic mud when Vesuvius erupted in 79 A.D. The buildings have been so well preserved that you can walk down streets that appear nearly the same as they did to the Romans over 2,000 years ago. See the original timbers in the buildings and clay pots stored as they would have been at the time of the eruption. You’ll see the House of the Argus, the public baths with their well-preserved frescoes and mosaics, and the house of the carbonized furniture which still has the marital bed intact! Many of the town’s inhabitants were supposedly able to flee to safety, unlike the residents of Pompeii, who were not so fortunate. 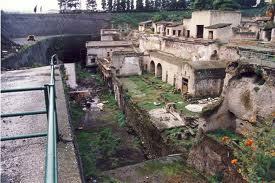 On the return journey we will stop for a guided tour of the ruins of Pompeii. You will enter the fabled city through the Sea Gate as you experience a walk down the cobbled street to the Agora, surrounded by temples, porticoes and law courts. It was the religious, civic and business center of the city. Because Pompeii was so well preserved, you can see many fine details that reveal the lifestyles of the residents, such as mosaic floors and colorful frescoes in some of the homes. Explore the ruins of Pompeii, the largest of the towns buried by the Vesuvius eruption with a private guide.